My daughter has the gift of rhyme. Her Nana has become lovingly referred to as Nana Banana and I am affectionately known as Mama Drama. Maybe she inherits this from the poet in me or perhaps she gets it from her love for Dr. Seuss. Her favorite Dr. Seuss books over the past couple of weeks have been ‘The Lorax’ and ‘Oh, The Places You’ll Go’ , but her constant favorite is Dr. Seuss’ ABC book. She knows this one by heart and can read it over & over again and her favorite Seuss creature in it is the Fiffer Feffer Feff. 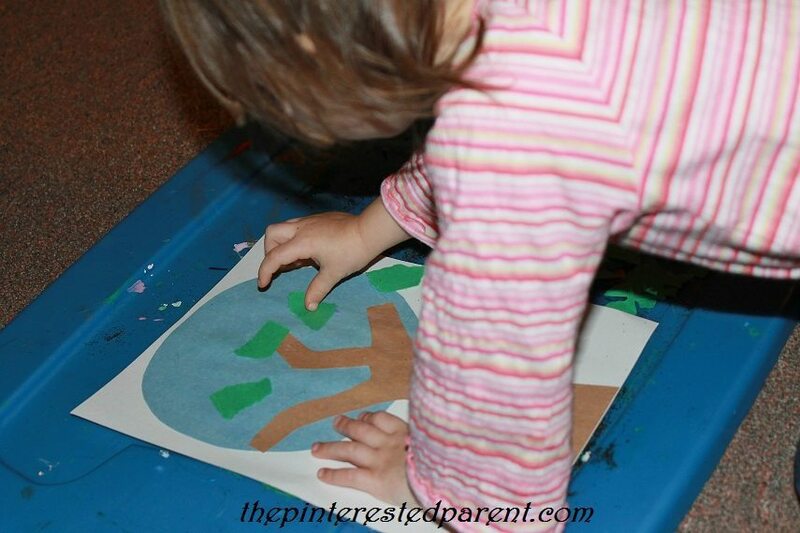 I have been doing footprint crafts with my daughter’s feet since she was a newborn. 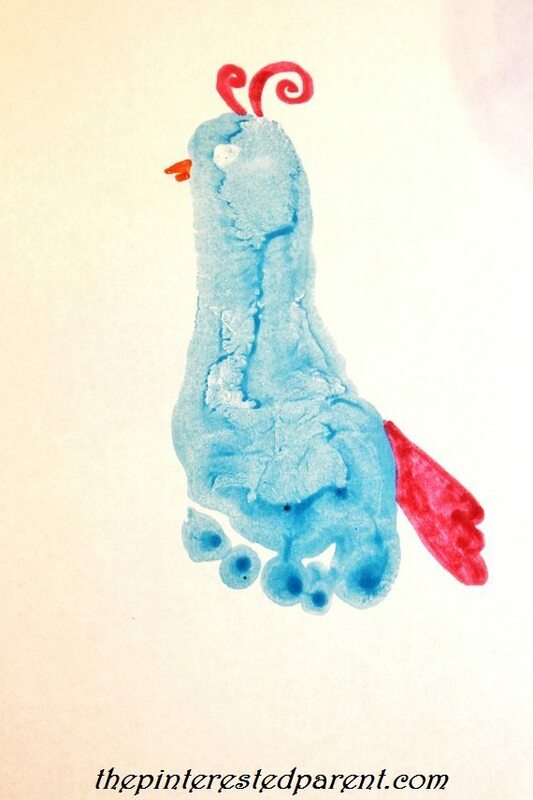 I have keepsake after keepsake of her adorable little feet, which my daughter refers to as her stinky feet crafts” Sometimes she even paints mine and and makes crafts out of my feet. 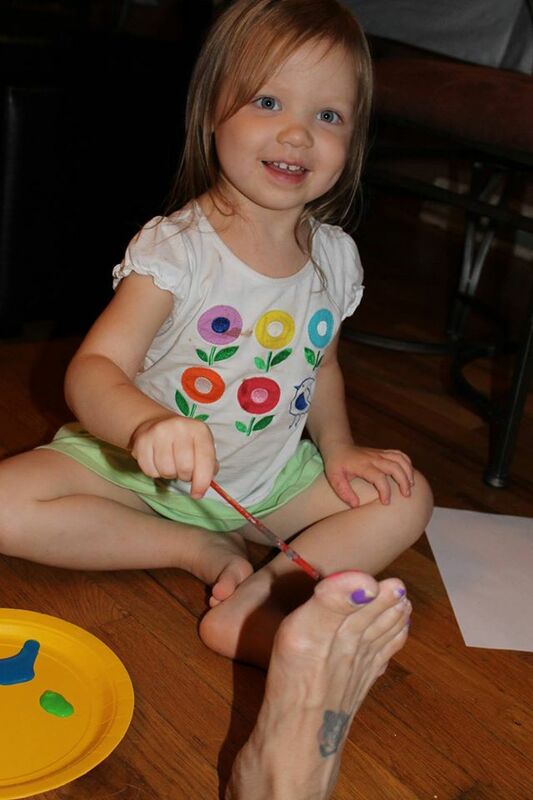 Last night, we made a stinky foot craft of her favorite Dr. Seuss character to put in her reading area. 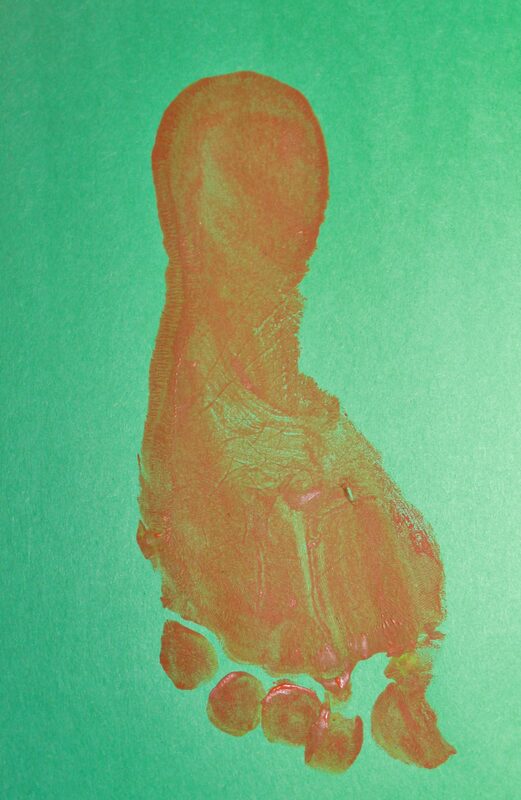 We dipped her foot in orange paint & pressed it onto a green background because that is how it is in the book. 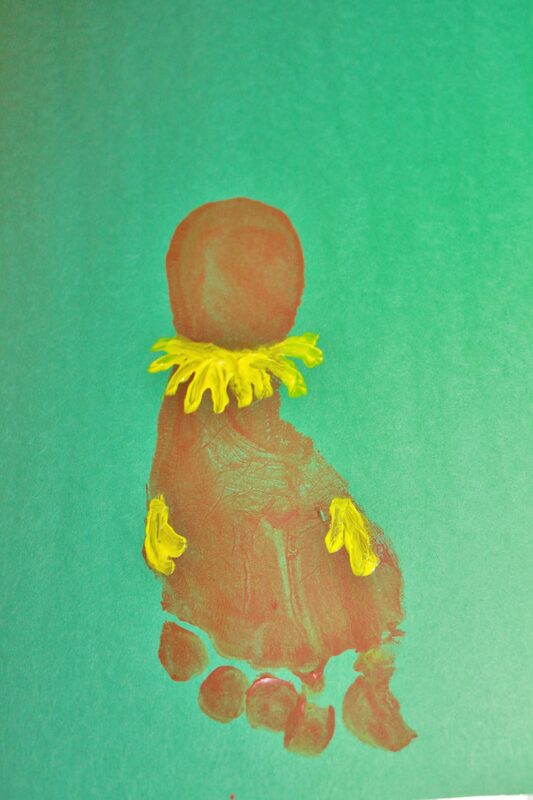 We painted in the furry collar & hands with yellow paint. 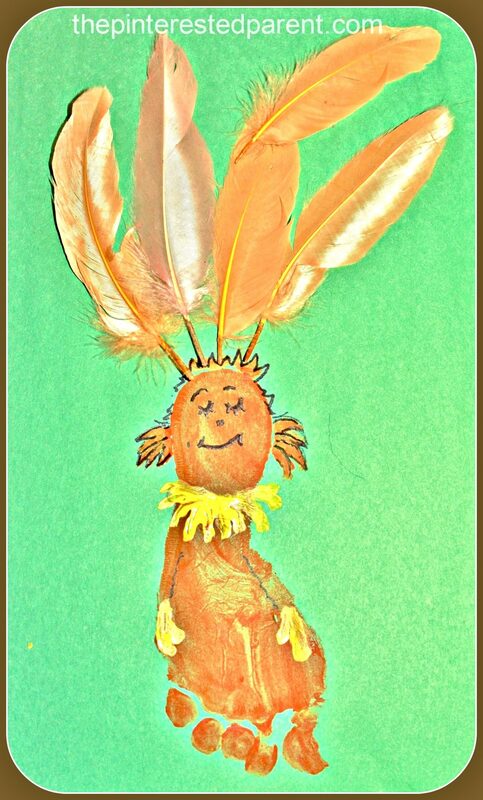 We drew in the face & added spiky hair to the sides & top of his head and finished it off by gluing 4 feathers to the top of his head. Valentine’s Day is coming & with it comes the flowers, the chocolates and the cards. 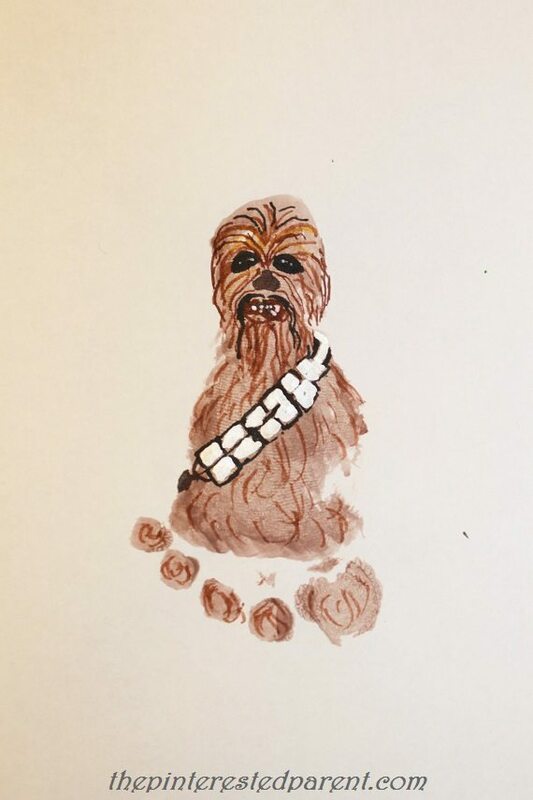 My daughter has already started getting excited about making Valentine’s cards for her family & friends. 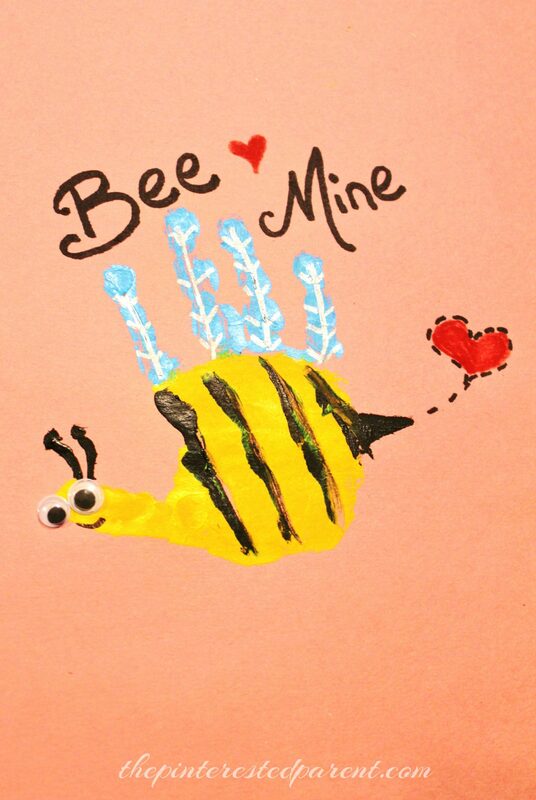 I was excited too because let’s face it, there is nothing sweeter than getting a Valentine from your little one. 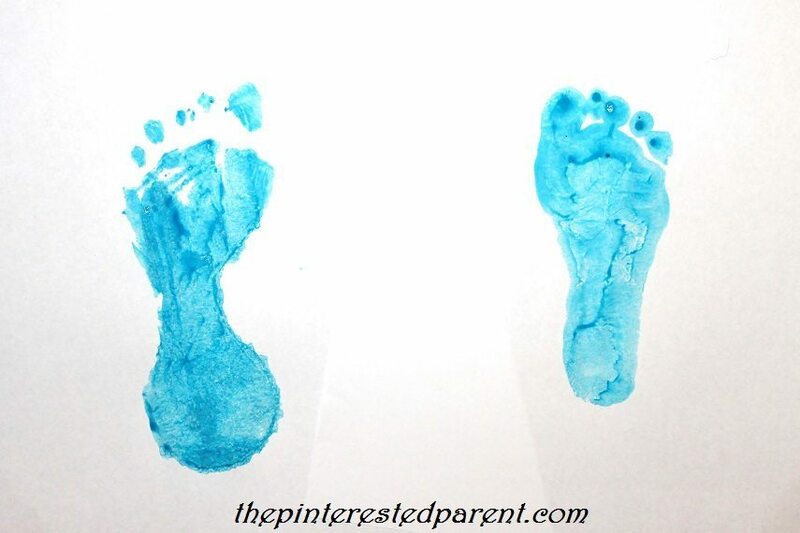 We love hand & footprint crafts because they make wonderful keepsakes. 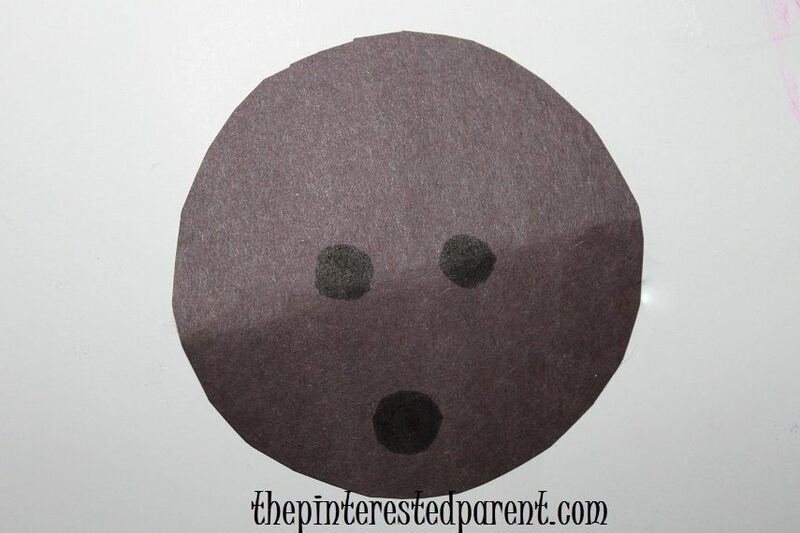 This adorable Valentine is cute & easy to make. 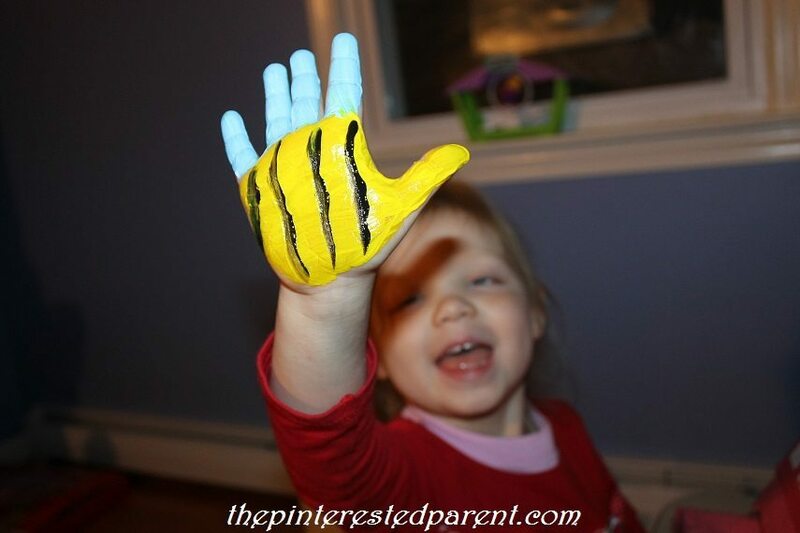 Paint your child’s palm and thumb in yellow. Paint black stripes over the yellow paint. Paint the fingers for the wings. I chose light blue for our wings. Press their hand onto a piece of paper. 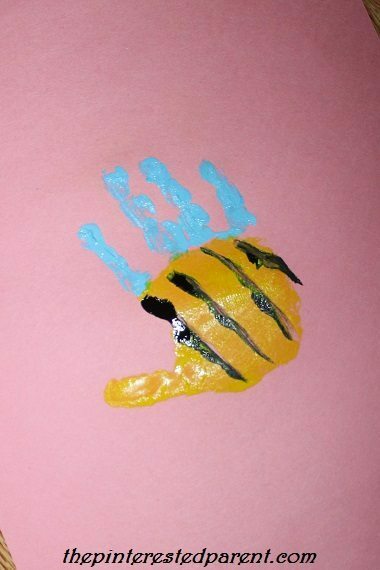 Paint in antennae and a stinger. Add googly eyes & a mouth and draw in wing veins. Add your message. (I love puns.) Add a heart trail or a few hearts to finish it off. It seems as if the holidays fly by quicker & quicker each year. Next week is Christmas & then the following week we will be ringing in the new year. Not long after we clean up our New Year’s confetti, we will be celebrating another birthday for our little girl. She turns 4 in a few weeks & I cannot believe how quickly she has grown. I would love to be able to keep her small forever. I know that this will not happen, but I can at least preserve some of her tiny cuteness while I still can. 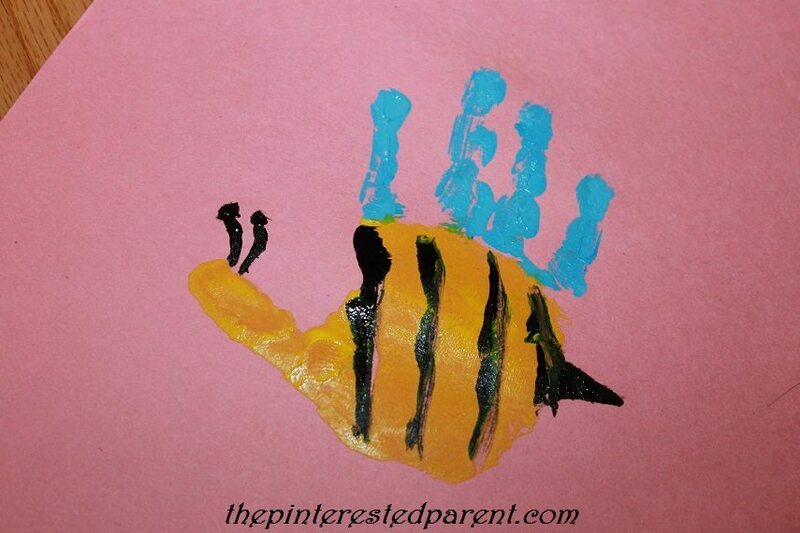 This is why I love hand & footprint crafts. It is fun to compare each new print with older ones just to see how much she has grown. With 2016 fast approaching, I wanted to make a holiday keepsake to kick off the new year. This was a simple and fun project. 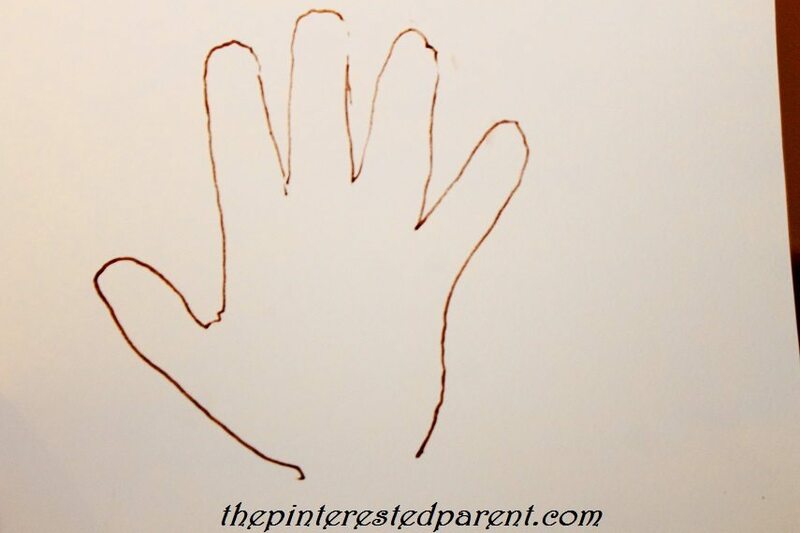 Trace your child’s hand or have them trace their own. 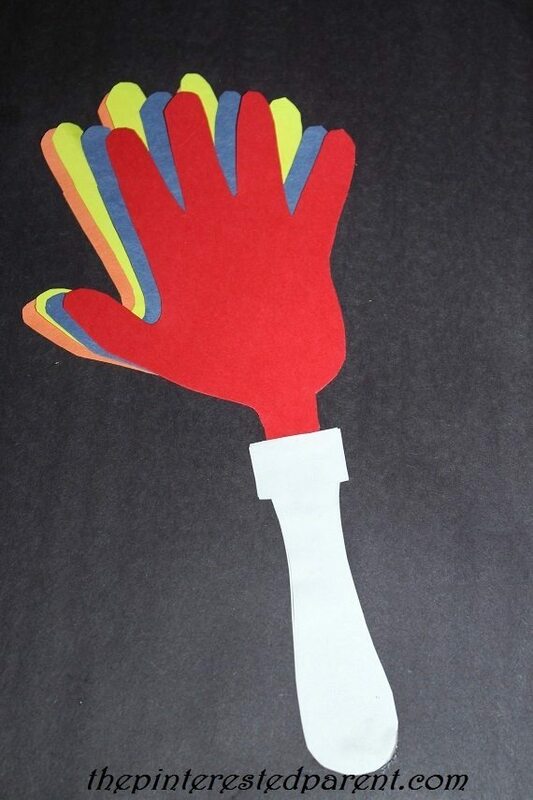 Cut out a few different colored hands using the tracing. 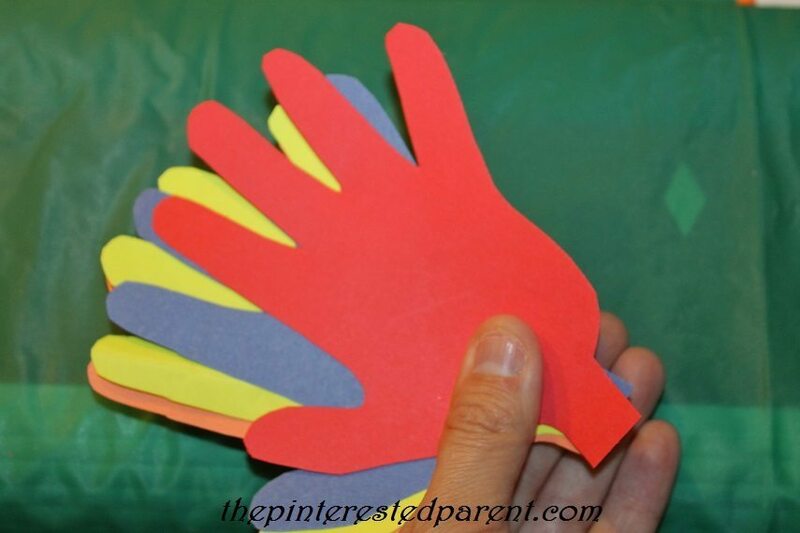 Fan the hands out & glue them together. 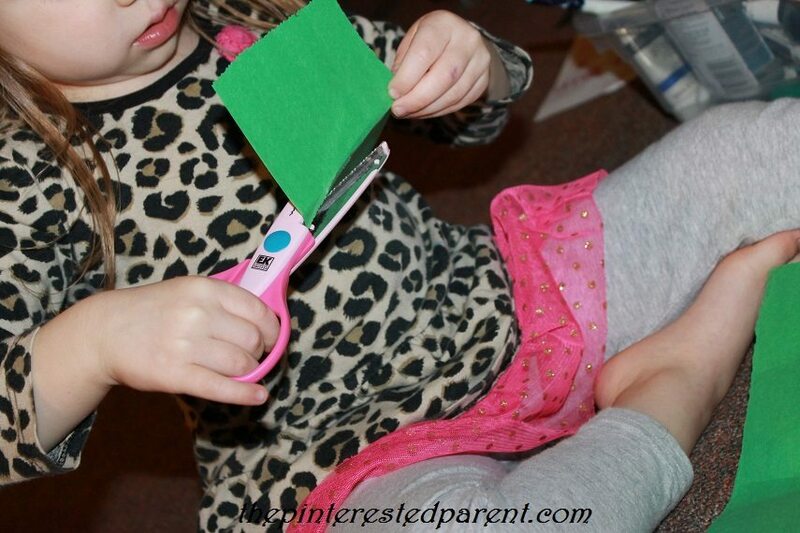 Cut out a handle for your hand clapper & glue underneath the hands. 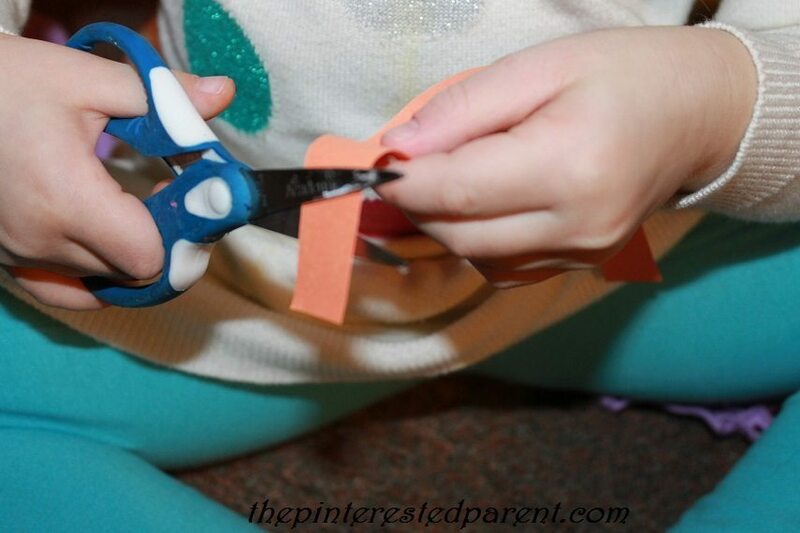 Cut out confetti & streamers or let your child if they are able to use scissors. We have been working on our cutting skills a lot lately, so Mai couldn’t wait to help me cut the confetti. Glue the confetti & streamers into place. Don’t forget to label your clappers with your child’s name & the date. This week has been a fun holiday filled week. We snuggled up every night & watched a different Christmas movie and yesterday went to the library to pick out holiday books. When we got home we read our new books and listened to Christmas carols. We got to listen to one of my favorite carols, which is ‘the 12 Days of Christmas’ This is a holiday song my daughter doesn’t know very well yet. She listened to me sing & asked “What’s a partridge?” I told her it was a bird. “I can make that” she told me. 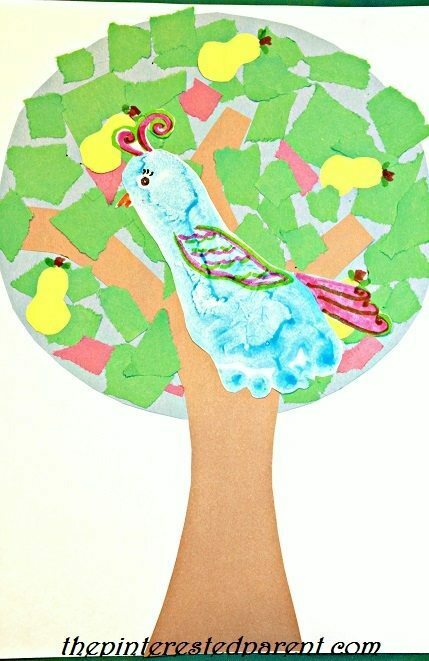 I asked her if she wanted to make the partridge & the pear tree. She did, of course. Since we are still living with our little friend Ashley while our house is in the final stages of construction, Ashley joined us for holiday crafts. As I told you before, my daughter is very into cutting these days. 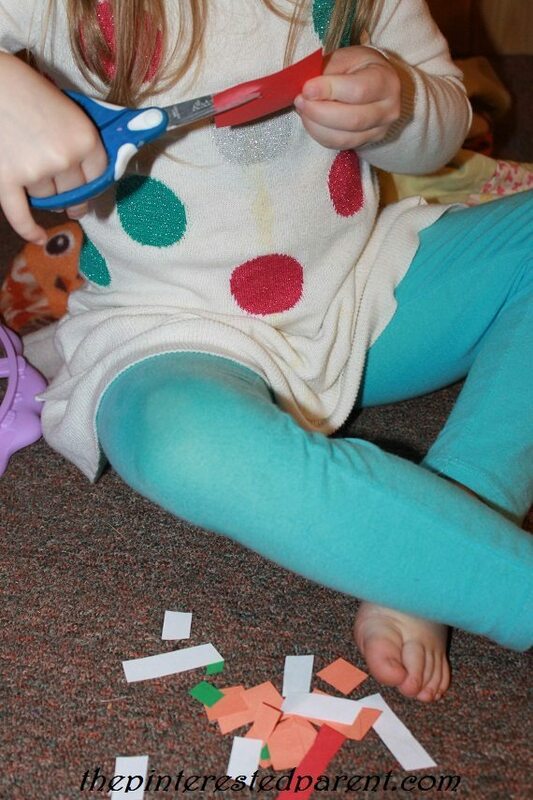 She will take every opportunity that she can to use her scissors. 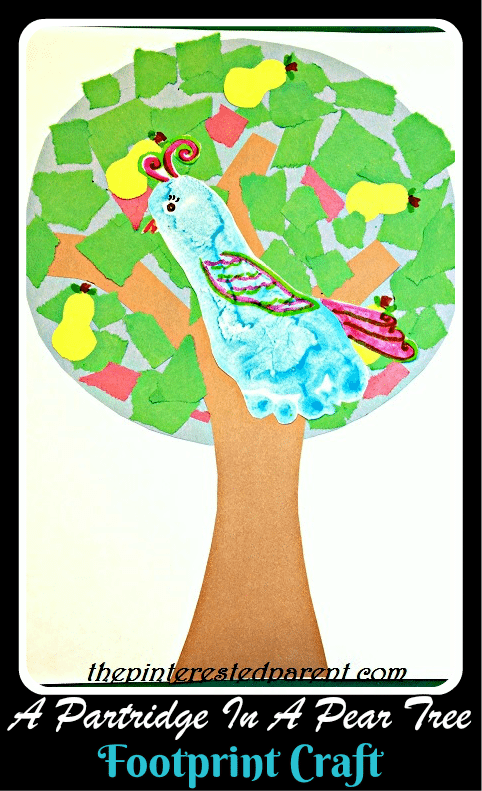 She wanted to make the pear trees out of cut paper, so she cut green & red construction paper into little pieces, while Ashley & I tore some. 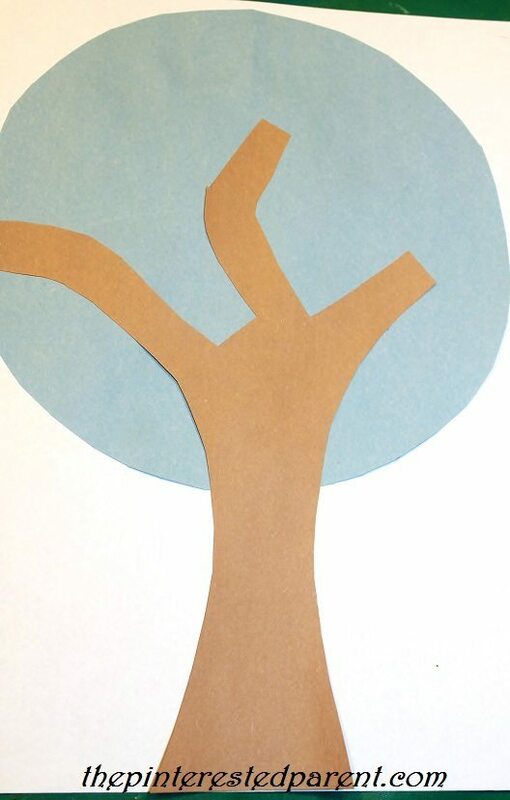 I cut out trunks for everyone out of brown construction paper & I cut out a big blue circle as a back drop & a guide for placing the pieces of paper. 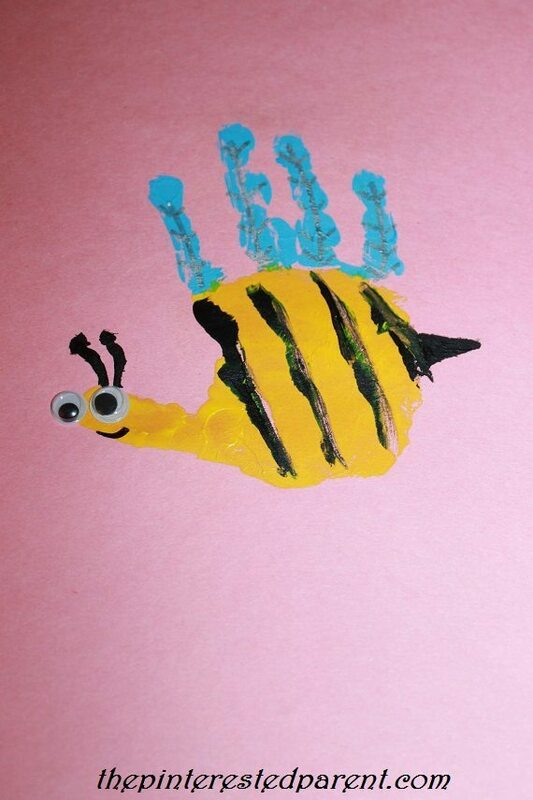 I gave the kids glue sticks & let them glue away. 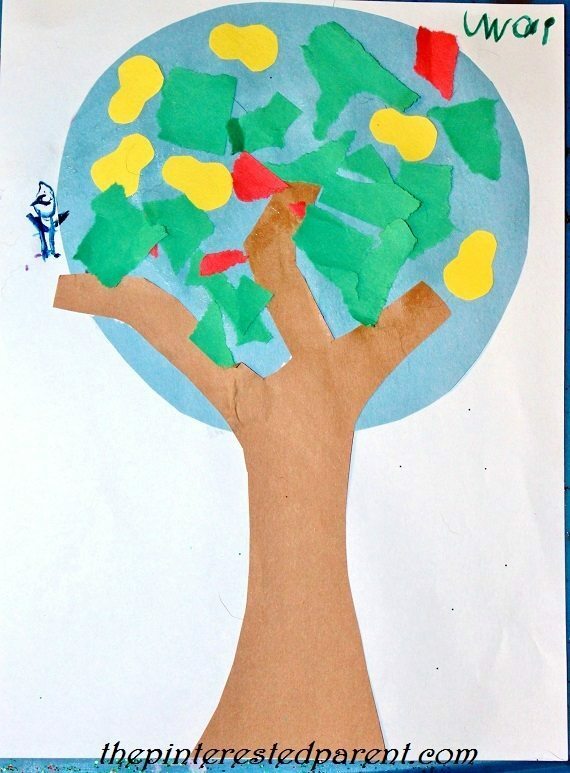 I cut out small pear shapes for them as well & they added them to their trees. They drew their own partridges with markers. 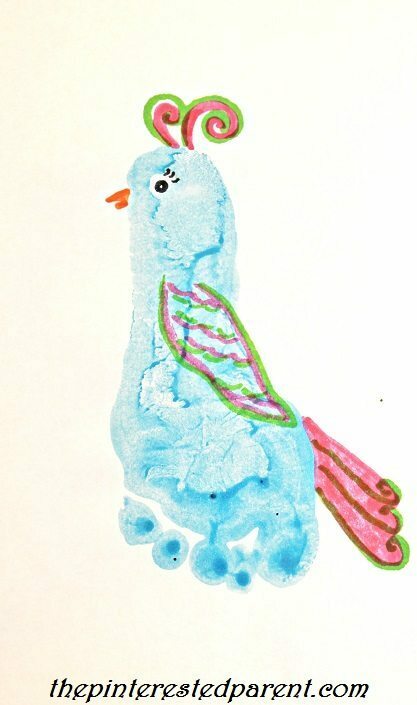 For my tree, I decided that I was going to make a footprint partridge. 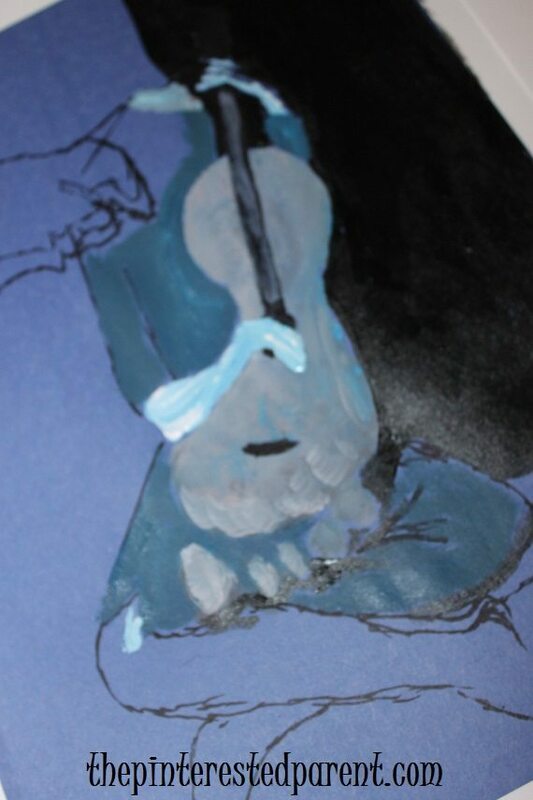 I painted both girl’s feet in blue & pressed them onto a piece of paper. I proceeded to turn them both into partridges. I cut around the partridges & added them to my trees. 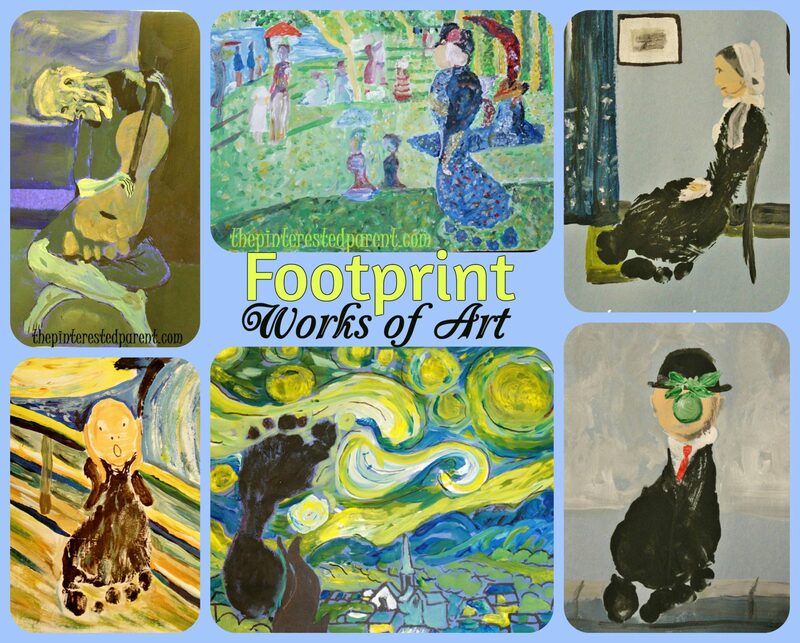 I try very little to hide my love for footprint art. I love it. I just can’t help it. So when my sister-in-law called me over the weekend and asked me if I would be willing to do footprints of her baby, I jumped at the chance. I asked her what she had in mind & could not have been more excited by her answer. 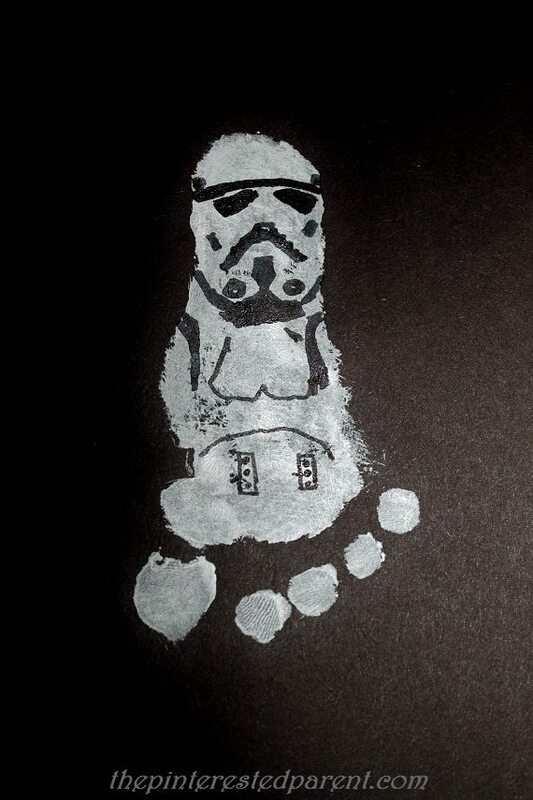 She had requested Star Wars footprints. 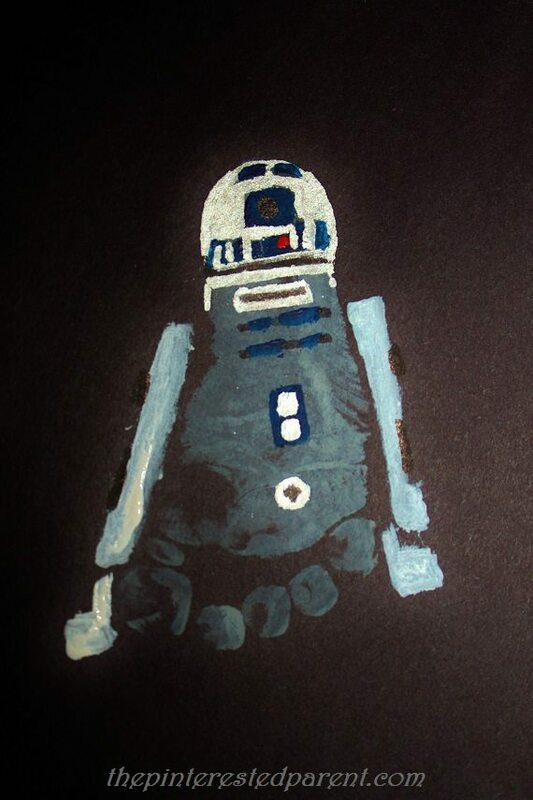 If you follow me on Facebook, you have probably already noticed by the many Star Wars crafts, activities and things that I am a big fan. I was actually shocked at myself that I had not yet thought of making these. Mai & I visited with her aunt & cousin. Mai wanted to help paint his little baby feet. They were so tiny compared to my daughters. I had forgotten that feet could even be that small. 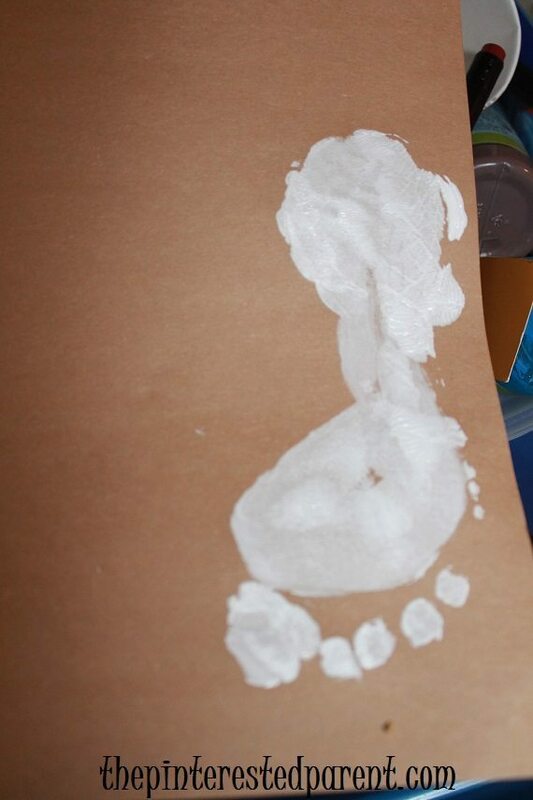 I was a little worried at first, not having done a footprint craft on a foot so tiny in quite some time, but after the first one, I was excited and ready for more. Once I started, I could not stop. My sister-in-law loved them & I was pretty pleased with them as well. 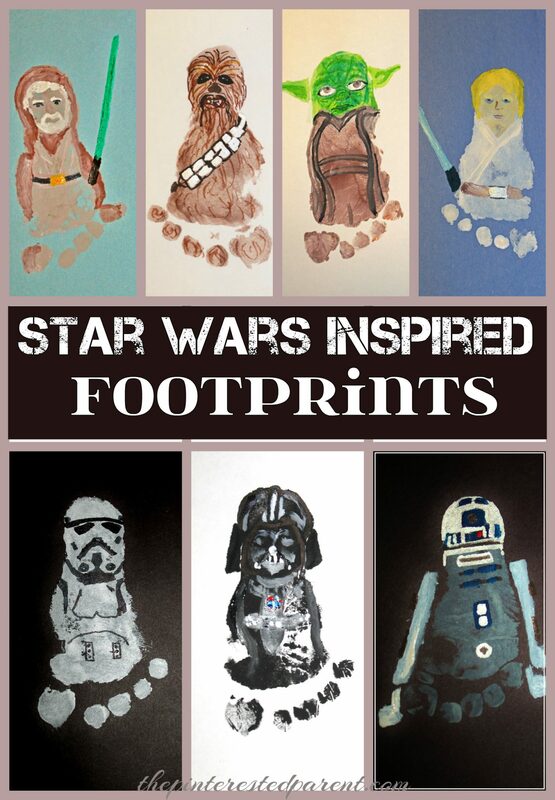 Check out more Star Wars gift ideas. Thank you as always for stopping by. 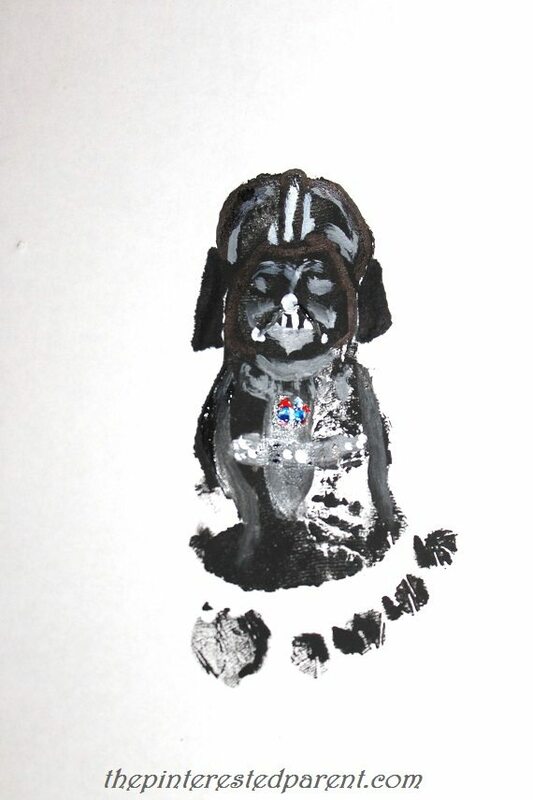 May the force be with you. Please follow us on Facebook as well. It is that time of year again. It is time to break out the Christmas decorations, send out your Christmas cards and put on your favorite carols. It is also time to bring that sneaky little elf out of hiding. We started the Elf on the Shelf tradition last year when we thought Mai was old enough to enjoy him. This year unfortunately, poor little Koontz (the name Mai picked for him) is locked away in storage waiting for our house to be finished. 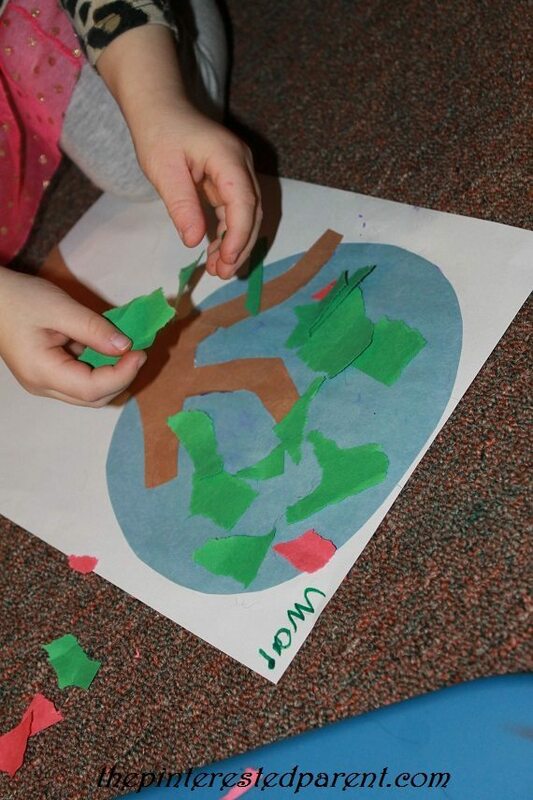 Footprint Crafts are my favorite. 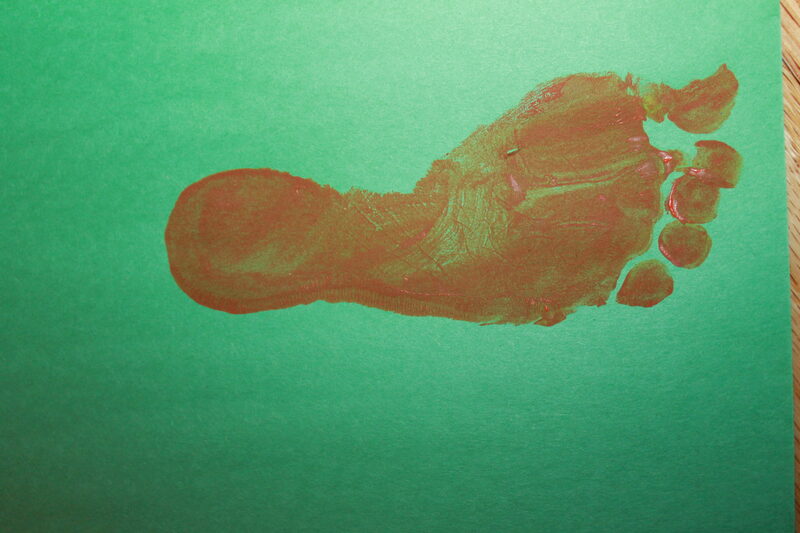 I have a box full of my daughter’s footprints throughout her life and have many in frames as artwork for her playroom. These are wonderful keepsakes that I will have forever or until I pass them down to her. 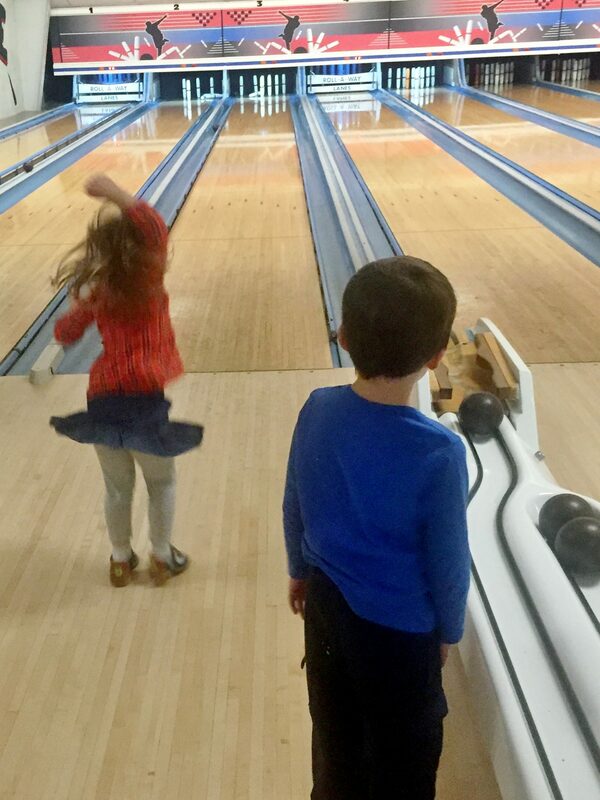 We have taken our daughter bowling for the past two weekends. 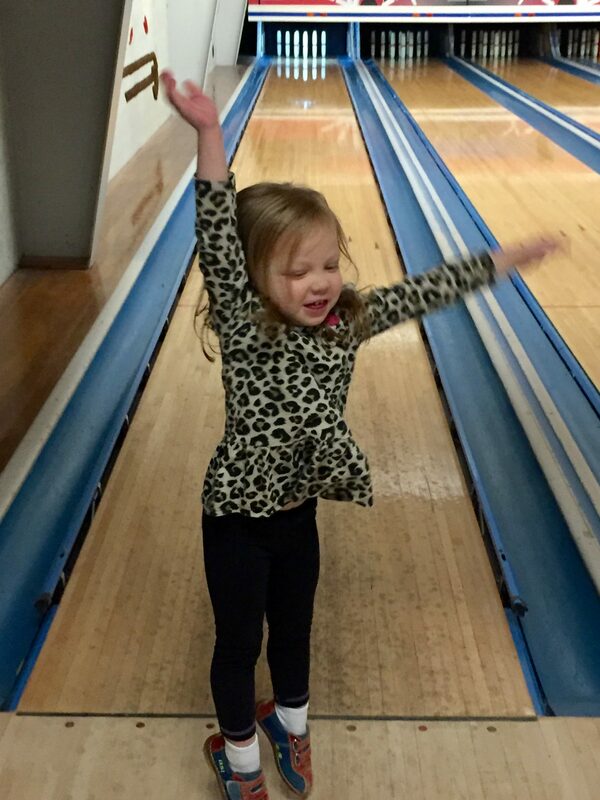 She loves family bowl & get really excited when she knocks down the pins. I have to be honest, she is almost better than me, but let me clarify by telling you that I stink at bowling. Her reaction when the pins fall down is priceless. She is such a joy to watch. Last night’s bowling adventure turned into a perfect craft idea. 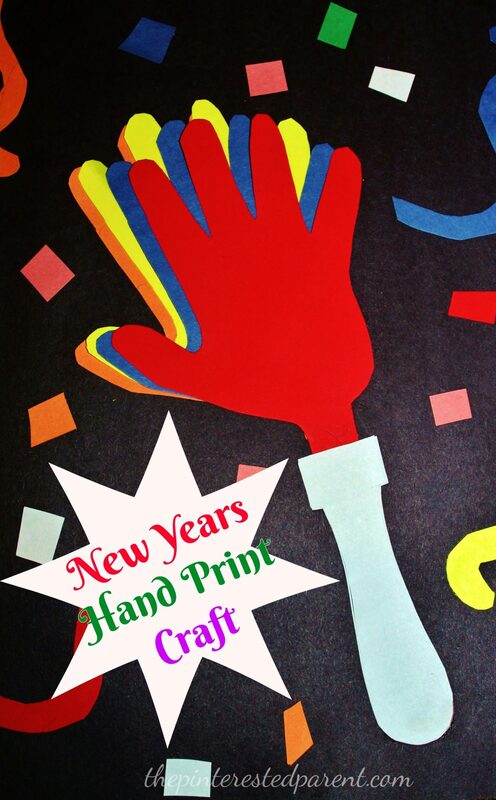 Since you know I love me some footprint crafts, it should not surprise you to see another one. This is a pretty simple one. 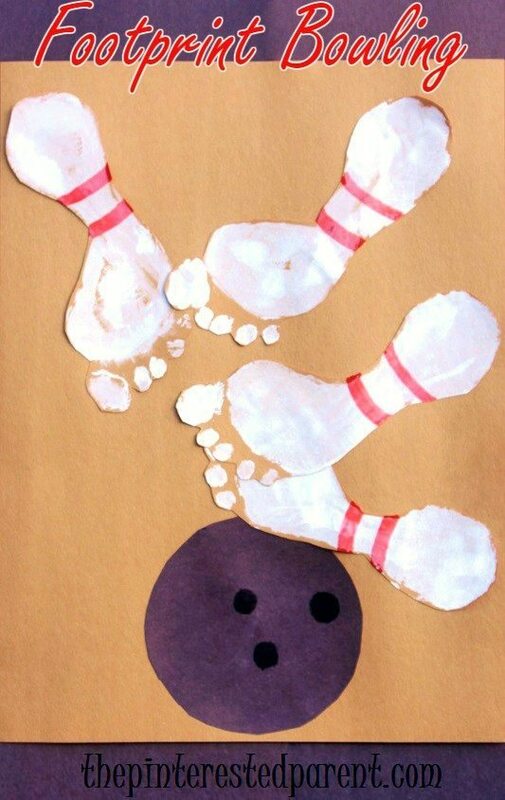 If you have a bowler in your family, this would be an adorable gift idea. 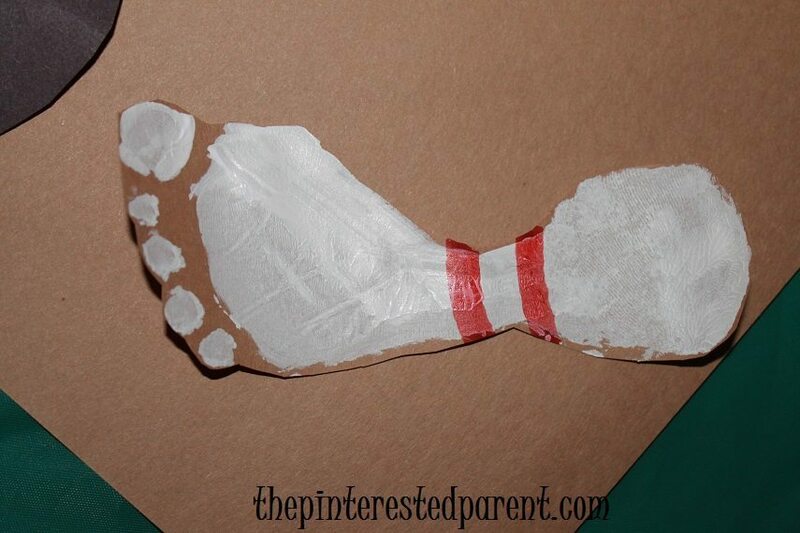 Paint your child’s foot white & press onto a brown piece of paper. We made 4 pins, so we did this 3 more times. You can choose to make more or less if you like. Let the feet dry & then cut around the feet. Draw in or paint two red lines below the heel. 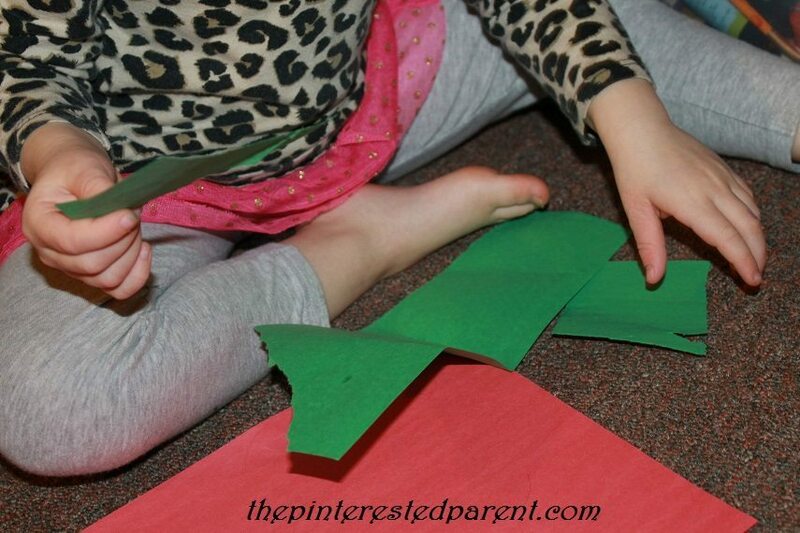 Glue down the ball & pins onto another brown piece of construction paper. This is the only way that I could ever actually get a strike. 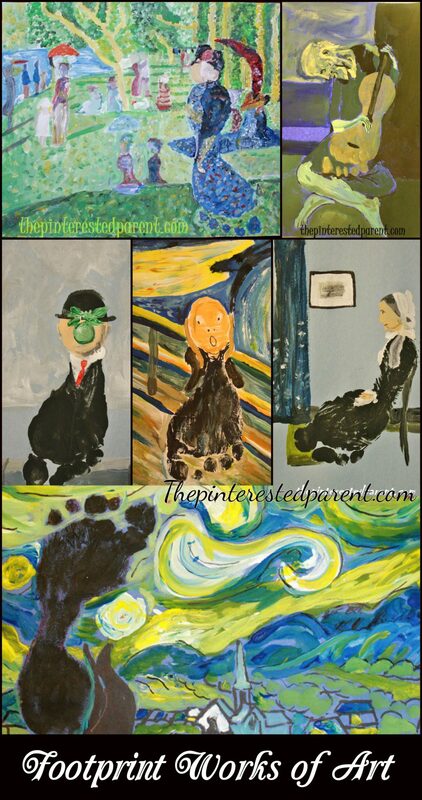 Over the past couple of months, I have been enjoying recreating famous paintings with the use of my daughter’s footprints. It all started because I wanted to make a black cat craft for Halloween. The cat reminded me of the famous poster art “Le Chat Noir”. From that one footprint craft, I could not stop. 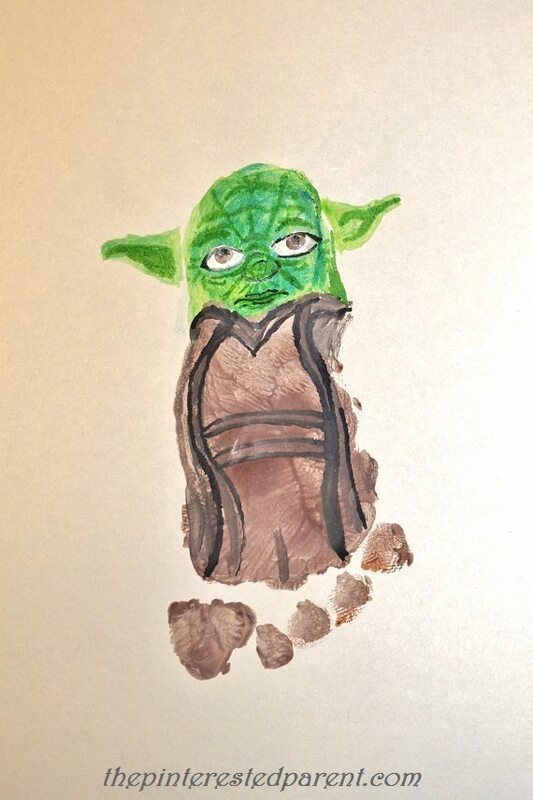 I felt inspired to turn my daughter’s little feet into great works of art. 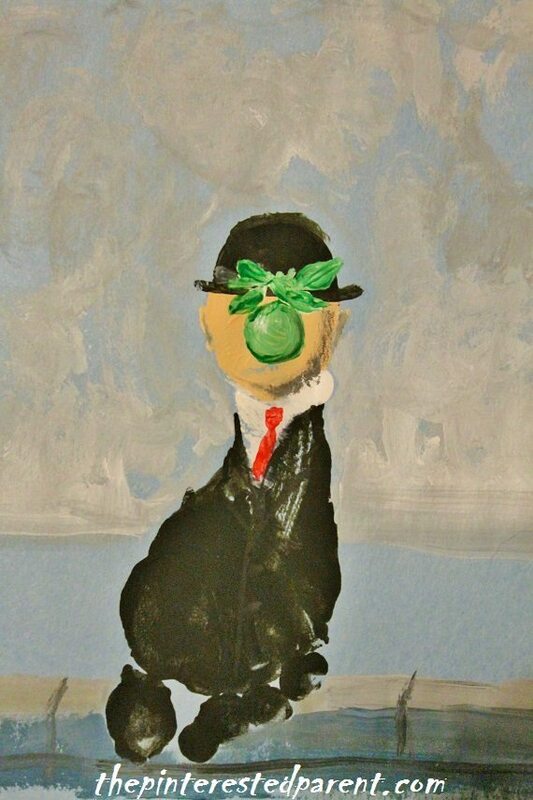 ‘The Son Of Man’ aka The Man in the Bowler Hat by René Magritte always reminds me of the movie The Thomas Crown Affair. James Abbott McNeill Whistler’s ‘Arrangement in Grey and Black No.1’, more commonly known as Whistler’s Mother was a fun one to make. 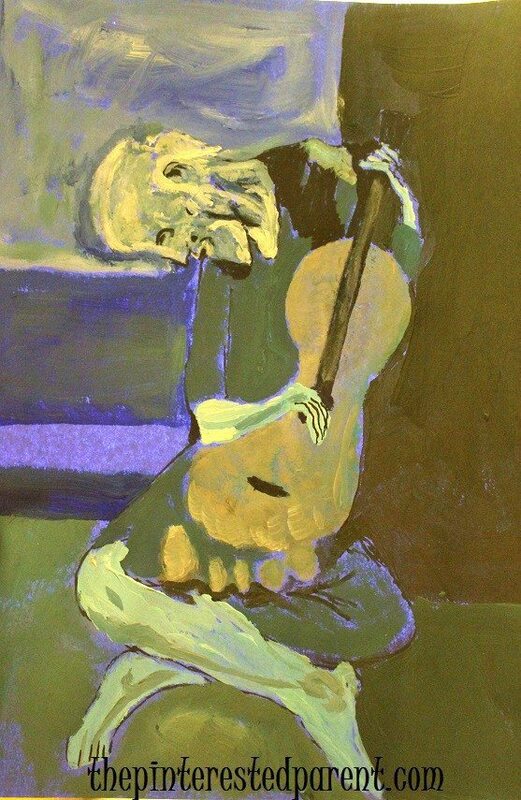 ‘Starry Night’ by Vincent Van Gogh fascinated my daughter. She watched me paint in the swirls and asked if she could make a ‘Starry Night’ too. She has since made her own recreations several times. I added two more to my collection this weekend. 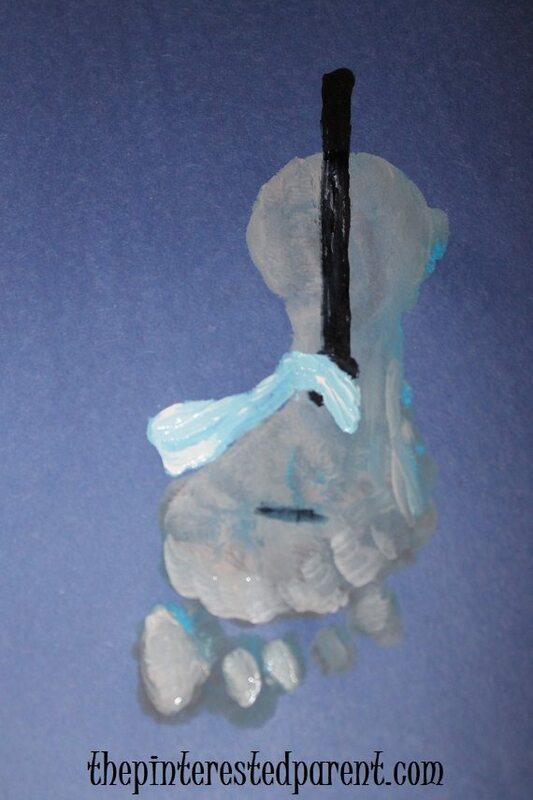 On Saturday, I made a footprint art inspired by Pablo Picasso’s ‘The Old Guitarist’. My husband really liked this one. I was pretty excited at how it came out too. 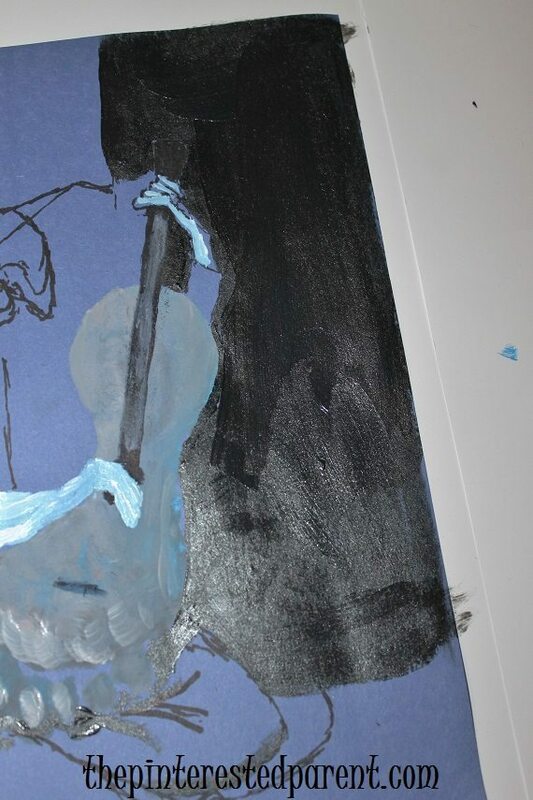 I only needed 3 colors for this one, so it was less messy than my others. Last but not least, was my toughest challenge. It seemed like a good idea at the time, but tackling a Seurat inspired ‘A Sunday Afternoon on the Island of La Grande Jatte’, was a bit more than I bargained for. 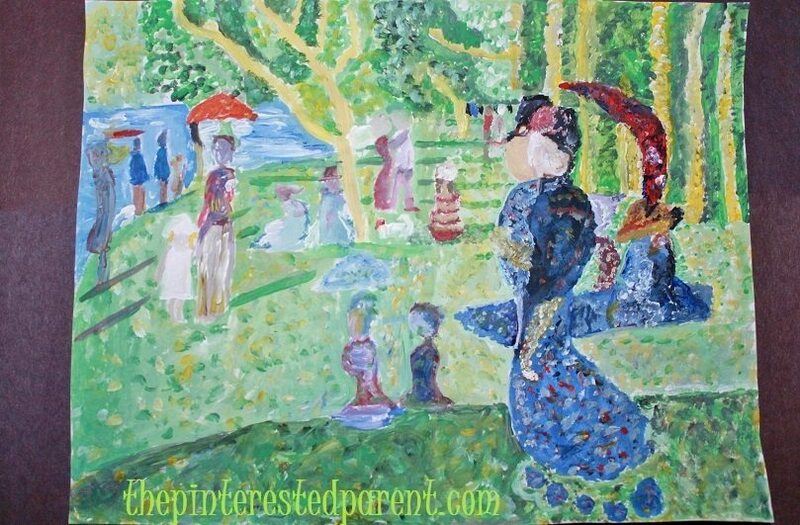 It is no wonder it took Seurat 2 years to paint his masterpiece. My much much much smaller footprint version was no Sunday afternoon walk in the park, but we finished it. Phew!! Can you even spot the footprint in all of those spots? These were all a ton of fun to make & I cannot wait to display my daughter’s feet throughout the house.